This processor checks for emails in a specified folder, downloads them, processes the relavant content to an activity on a new or existing contact, then moves them to a new folder. In the days where everyone ran a standard email server accessible with POP3/IMAP, this was perfection. The most difficult part I found of this entire setup of the Gmail setup, was getting authenticated with Gmail. Google employs multiple layers of security for their accounts and letting in some random login attempt from and unknown ip at an unknown location is a big red flag. Also, recently, Google has been restricting the use of non-Google made applications over security concerns. This includes the IMAP protocol CiviCRM will use to interface with Gmail. Here is where using Gmail becomes very useful. CiviCRM, by default, imports email from INBOX, moving it to the INBOX/CiviMail/processed or INBOX/CiviMail/ignored folder after processing. We can change this by change this behaviour in CiviCRM. By having CiviCRM import mails from another folder (tag), we can use Gmails filters to only tag specific emails that we want imported into CiviCRM. For obvious reasons, I chose the tag CiviCRM (see above). In Gmail, I created a number of filters to apply the tag CiviCRM to all the emails that I was sure I wanted in CiviCRM. If you are unfamiliar with Gmail filters, you can learn more here. With this in mind, first, we need to setup CiviCRM. Log into CiviCRM and go to the Administrator Console, then to the Mail Accounts (civicrm/admin/mailSettings). Create a new account and put int your credentials. Enable the Fetch Activities scheduled job in the Administrator Console -> Scheduled Jobs (civicrm/admin/job). Setting up Gmail is a little more detailed. First enable IMAP access in Gmail. 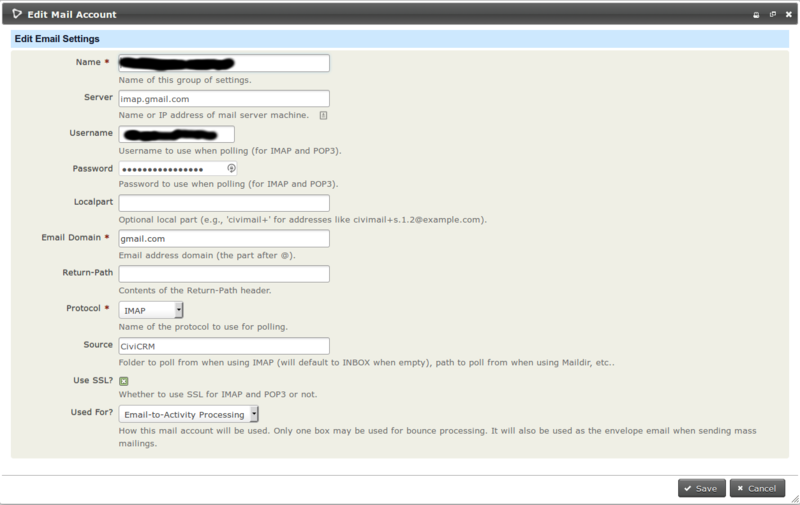 Go to the settings and click on the "Forwarding and POP/IMAP" tab. Click "Enable IMAP". Next we need to enable Access for Less Secure Apps. Its easier to just click on the link while logged into Gmail. To find it manually: go to Gmail, click on the picture in the top right, click "My Account", then click "Connected apps & sites". It is currently the last box. Finally, Google with still probably block CiviCRM's login attempt. Open the Unlock Captcha page and run the below command in the command line of the server (ssh probably required). Likely you will get an error similar to: "Died during callApi". Error codes are pretty undescriptive. If you get and error, fill out the Captcha and try again; tt is probably a Gmail authentication error. Try some of the other procedures here. The possibilities of the setup are great. I have only begun to explore the multitude of filters I can use. Please comment if you have found any good ones to use. I tried to keep it simple :) It got pretty long by the end. This is a great summary! For reference, this works well with Google Apps, too, and many of our clients do exactly this. The only difference is that your "email domain" is the actual domain of the email. The connection to Google itself is the same, however. We actually set this up originally on Google Apps too! Thank you for these instructions. For our purposes we can not turn off the 2-Step Verification, which then blocks access to allowing "Less Secure Apps." The alternative was generating an App Password for each Gmail account and using that in the password field in Civi Mail Accounts settings, as shown in your example. All the other fields and settings were as shown. Everything worked great with that change, and did not did not require the additional command line step. Thanks again.